Lancashire have confirmed they are in talks with former England all-rounder Andrew Flintoff over a return to the team for this season's Twenty20 Blast. Flintoff, 36, who has not played professional cricket since 2009, has recently been training with the club. "We are in talks with Andrew over possible involvement with the club," a Lancashire spokesman told BBC Sport. 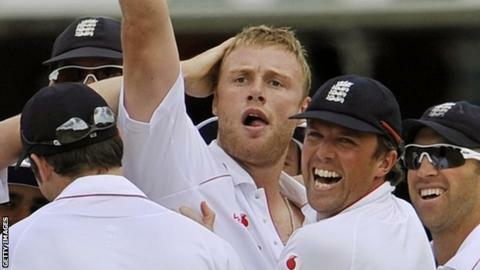 Flintoff is unlikely to play in the club's first game at Nottinghamshire on Friday because of an ankle injury. Andrew Flintoff had a short spell as a professional boxer after retiring from cricket. He defeated Richard Dawson on points, in what proved to be his only contest. However, the talks - that would also see him take on a formal coaching role within the T20 set-up - are at an advanced stage. He was a leading member of the Ashes-winning teams of 2005 and 2009 but, when given the captaincy for the 2006-07 tour to Australia, he could not prevent them suffering a 5-0 whitewash defeat. A series of injuries forced his retirement four years ago, and since then he has forged a successful media career and also had a brief stint as a professional boxer. Last month, the chairman of his former club side St Annes said he could turn out for them this summer. Flintoff, however, is setting his sights even higher having been working with Lancashire's academy since the winter. The prospects of him playing in the opening game of the revamped Twenty20 Blast against at Trent Bridge on Friday are low after he injured an ankle in fielding practice last week. He is also unlikely to be fit for the match against Worcestershire Rapids at Old Trafford 24 hours later - but it would seem to be only a matter of time before he is back in action.